Destination PSP, a high-end merchandising and marketing company, announces the opening of a unique retail experience in the heart of Palm Springs. 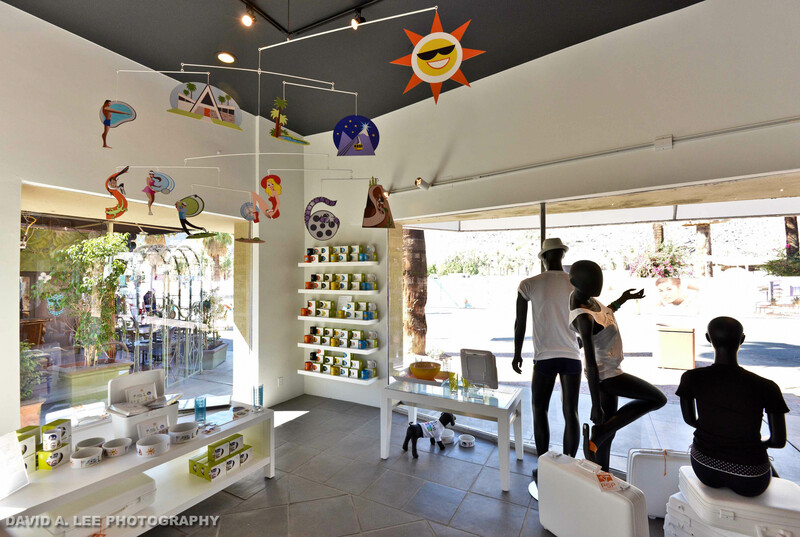 The store features Coachella Valley branded and inspired merchandise, and also highlights partnerships with several local non-profit organizations, national brand partners and signature events, as well as the merchandise created for them. We have established ourselves as a branding company that exemplifies and celebrates the renaissance of Palm Springs and the Coachella Valley. Our mission is to create tangible memories through inspired merchandise. Destination PSP, a high-end merchandising and marketing company, announces the opening of a unique retail experience in the heart of Palm Springs. The store features Coachella Valley branded and inspired merchandise, and also highlights partnerships with several local non-profit organizations, national brand partners and signature events, as well as the merchandise created for them. The venue also serves as marketing space, offering special promotions, tickets sales and unique attractions related to the merchandise. The majority of Destination PSP merchandise is manufactured regionally with sustainably produced packaging, and all items are designed in-house. A large part of the company’s mission is to work with high profile non-profit organizations, aiding their branding, awareness and fundraising efforts through sales of quality merchandise. The company provides the official merchandise for the Palm Springs International Film Festival, Modernism Week, and other special events. Recently, the company designed products and created original products for the Palm Springs Animal Shelter, Desert AIDS Project, Coyote StageWorks, PS ModCom and Desert ARC, among others. Located at 170 N. Palm Canyon Drive, Destination PSP occupies an historic storefront in the Town & Country Center, just north of Tahquitz Canyon Way and across the street from the new Hotel Palomar currently under construction, along with the new open-air Museum Market Plaza. The store quietly opened its doors for business today, and the official public opening is scheduled for Thursday, October 30, 2014. 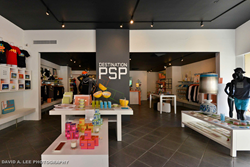 “It’s no coincidence that Destination PSP chose to establish its flagship location in this iconic downtown space,” continues Bernstein, “We are seeing an incredible redevelopment of downtown Palm Springs and Destination PSP is a part of it. 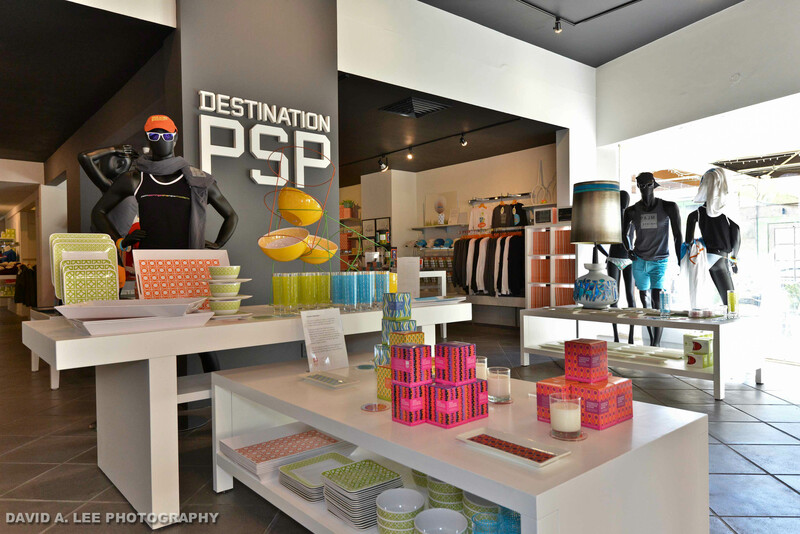 Destination PSP originally debuted in fall of 2012 at Raymond | Lawrence in the uptown design district with five distinct design collections celebrating the Palm Springs aesthetic. Since then they’ve developed numerous ‘products for the Palm Springs lifestyle.’ They’ve also partnered with Macys.com, which offers the company’s Sunmor melamine and acrylic collection of drink ware, serving dishes, and dinnerware. The line features quintessential mid-century designs that echo the patterns used in concrete blocks, privacy screens, etc., which are hallmarks of the midcentury modern architecture so prevalent in the area. The Town & Country Center complex, built in the “International Style” in 1948, is among the collaborative works of innovative and acclaimed architects A. Quincy Jones and associated architect Paul R. Williams, both of whom individually earned national distinction during their careers. The Center, with its interior courtyard, was built as a modernist commercial reinterpretation of the self-sheltering hacienda form found in earlier generations of desert architecture. In the coming months, Destination PSP will launch exciting new products from additional charities such as Desert ARC and AIDS Assistance Program, and has plans to introduce several special event, collectible and home goods lines. For the latest Destination PSP news and product information, visit http://www.destinationpsp.com.